Baby acne and baby eczema are two common skin conditions and both can appear when babies are between one and six months old. So when your baby has a red spot on that precious little face, how do you know the difference between baby acne and eczema? With regard to eczema vs baby acne, here’s what you need to know and how to spot the difference. Baby acne can appear any time from birth until about six months old, but the most common time is between weeks 3 and 6. It looks a lot like teenager acne – with those not so attractive red and yellowish bumps on the face. The acne can even appear red and inflamed if your baby has a double whammy of acne with cradle cap (clinically known as seborrheic dermatitis) on the eyebrows or around the nose. So, what causes baby acne? Baby acne is triggered by common factors such as oils, bacteria, and hormones on their tender little faces. One reason baby acne is often the worst in their first month is that the baby’s own oils are mingling with their mother’s lingering hormones. What is it that causes baby eczema on the face? Eczema is essentially sensitive skin that acts rashy when it gets too irritated or dry. Eczema patches are red, dry patches of skin that are often itchy. Eczema affects different body areas based on age. Babies from one month old to two years old usually get eczema on the cheeks and outer sides of the arms and legs. Older children and adults can also see eczema on areas such as the scalp, feet and hands. 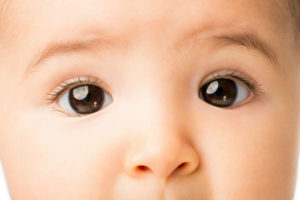 As babies begin to teethe – sometimes as early as 2 or 3 months old – they may also get a drool rash around their mouths. This drooling can also cause eczema flare-ups. Both conditions commonly affect the face. However, baby acne typically affects the central part of the face, but baby eczema affects the cheeks and the outer parts of the arms and legs. Both conditions are red, but baby acne is bumpy and is not itchy. Baby eczema shows up as raised itchy patches. Both conditions can be improved with topical over-the-counter 1% hydrocortisone (a topical corticosteroid). But – and this is a big but – baby acne will get worse with moisturizing ointment but baby eczema will dramatically improve with it. Both conditions commonly appear between 0 and 6 months old. However, baby acne usually clears up by itself without any specific treatment. Baby eczema, on the other hand, can persist into childhood and adulthood and needs a specific sensitive skin care regimen with possible medication during flare-ups. By following these simple steps you can soothe your baby’s red skin, whether it is baby eczema or acne. Give it a (gentle) scrub. Since bacteria and oils often cause baby acne, make sure to use a soft washcloth and a gentle natural baby bath wash to scrub those things way. But don’t try to scrub away the acne. Remember that it’s probably not bothering your baby and it will clear up on its own. Consider hydrocortisone. If you need your baby’s skin to look perfect for photos or Grandma’s visit, you can consider using an over-the-counter 1% hydrocortisone cream. Hydrocortisone cream is safe for babies over the age of two; however, it should not be used for more than two or three days. Remember he’s little. Your baby is experiencing baby acne due to mom’s hormones. This is not the same as adult acne, so never use an adult acne medicine on a baby. Lock it in. If your child (or either parent) has sensitive skin, moisturizing is going to be the key. Use a good moisturizing, natural eczema cream for babies (not a lotion, which is mostly made of water) after each and every bath to lock in moisture. Check out our luxurious feeling Baby Butter. Click to Order – Baby Butter – Enjoy 10% off this product using promo code “pibublog225” at checkout. Avoid fragrance. Fragrance can be highly irritating to sensitive skin. If you want that wonderful fresh-from-the-bath baby smell, look for washes and shampoos that use an essential oil. Our very own 2-in-1 Hair and Body Wash smells heavenly. 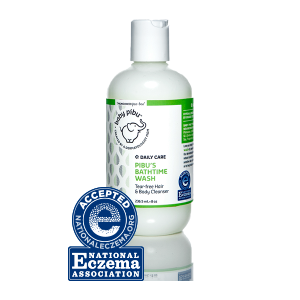 Click to Order – Bathtime Wash – Enjoy 10% off this product using promo code “pibublog225” at checkout. Bump it up. Once you notice any sort of redness, you need to switch the moisturizer to an ointment, which has the highest concentration of oil, and moisturize more often. 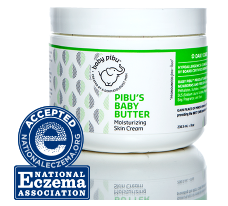 Baby Pibu’s Hydrating Ointment, is the perfect remedy for dry skin. 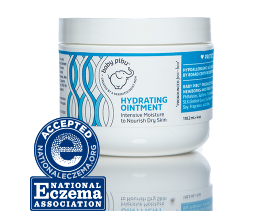 Click to Order – Hydrating Ointment – Enjoy 10% off this product using promo code “pibublog225” at checkout. Use hydrocortisone if needed, but sparingly. If your baby is really uncomfortable, you can apply an over-the-counter 1% hydrocortisone cream two to three times per day, for no longer than three days. Hydrocortisone is safe for babies two years old and older. If your baby is younger than two, or if the redness doesn’t seem to be getting better after three days, see your pediatrician or dermatologist. Check out more baby eczema treatment options to help your little one. Click to Order – Soothing Eczema Care Kit – Enjoy 10% off this product using promo code “pibublog225” at checkout. There you have it. 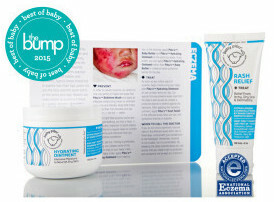 Now you know the difference between baby acne and eczema and how to treat it. Now go snuggle those delicate little faces! Click here for more information about Eczema. Click here for more information about Daily Care.